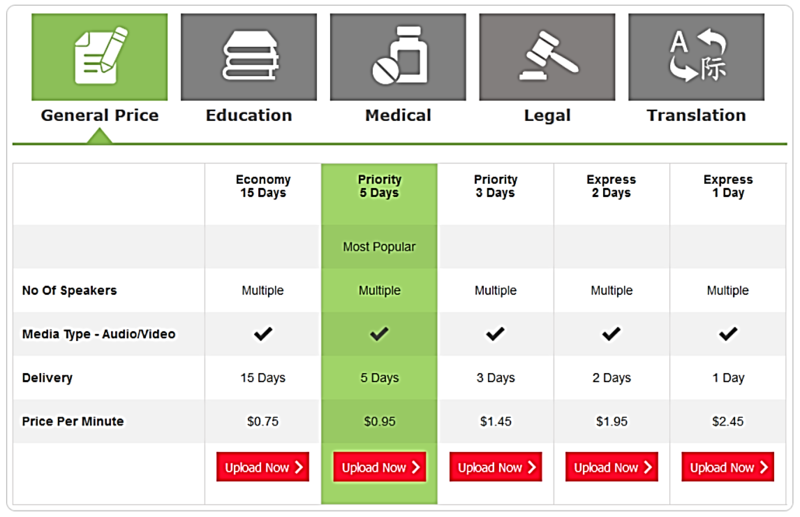 Please go to Price Page, select the required service/package and click on ‘Upload Now’ button as shown below. You can choose the service/package which best suits your need based on price and the required delivery time. Select Service: Here you can change the ‘Transcription Service’ package. Add 'Timestamp Service' if you require time stamp / time code service on your transcript. And check the 'Difficult Audio Quality' check-box if you think your audio/video file is difficult to transcribe (Please read more about difficult audio file characteristics in our FAQ). 1. Upload - Upload File by clicking browse button. You can upload the following audio or video files: AIF, AIFF, AMR, AVI, DSS, DVD, DVF, FLV, M4A, MOV, MP2, MP3, MP4, MPEG, MPG, MSV, QTFF, RM, WAV, WMA, WMV, VOB. And you can choose to upload file size as big as 200 MB. 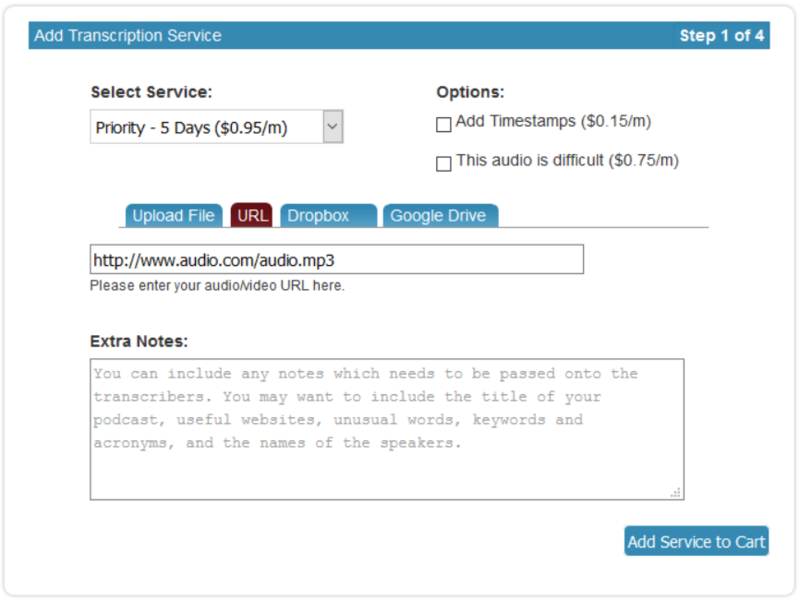 Also add ‘Extra Notes’ which can be passed onto the transcribers. The uploaded file/URL will then get added to the ‘Cart’ as show below. Here change the Duration (Minutes) field to match your Audio/Video duration and click on Update Cart button to calculate the total cost. Click on Continue Shopping button to add more Service/Package to your shopping cart. Click on Checkout button to proceed with your order. 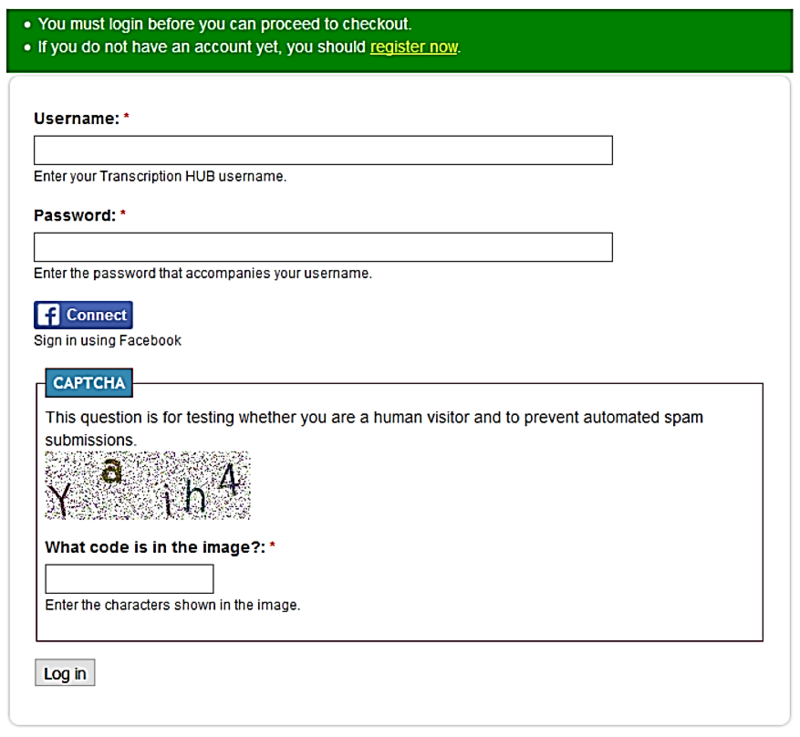 You will be taken to login page, where you have an option to register now or enter your username/password if you are a returning customer. Next, proceed to Checkout page, review your order and complete your Payment to complete your order. Please note, you don’t need a PayPal account to place your order, we accept Visa, Master, Discover, Amex, eCheck and PayPal to place your order. If you register with Transcription HUB, you can login to our website (www.transcriptionhub.com/user) to view or download your transcripts. The Transcripts will be normally delivered in .doc (MS Word) format,	Please email us to inform if the transcript is required in some other document format.